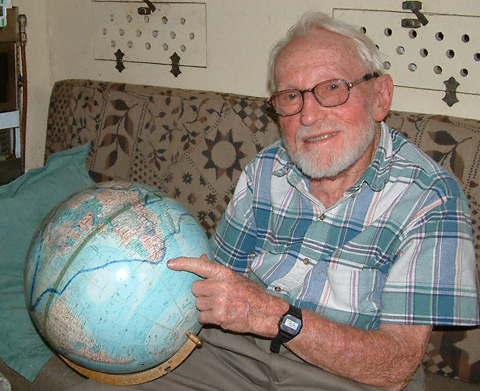 Longtime visitors may know that I’m the grandson of Captain Harry Heckel, the oldest man to circumnavigate the globe. Recently, I’ve had a number of visitors from France who are looking for information about my grandfather. I apologize as my French is rather poor, but the best place to find information on him is his book. It’s only available in English and I’m putting the link here. There’s further information about him on the Captain Heckel page, which can be clicked above. He passed away last year, and I was fortunate to visit him that day. In our final conversation, I was able to tell him that I had received a book deal from Harper Voyager for my series, The Charming Tales. Please feel free to comment below and I’ll do my best to answer any questions. Je ne parle pas Francais, mais mon epouse peux traduire. 🙂 Here’s a picture of Dr. Heckel himself. Posted on May 26, 2015, in Captain Heckel. Bookmark the permalink. Leave a comment.